Wow. Just wow. Can Hot Wheels get Gas Monkey Garage to design more cars? Let me rephrase that... Can Gas Monkey Garage just be put in charge of Hot Wheels’ paint choices? Lamley already wrote a quasi-review of the “Midas Monkey” to which I don’t have much to add. I just wanted to highlight the car’s fantastic gold-on-gold metal flake. 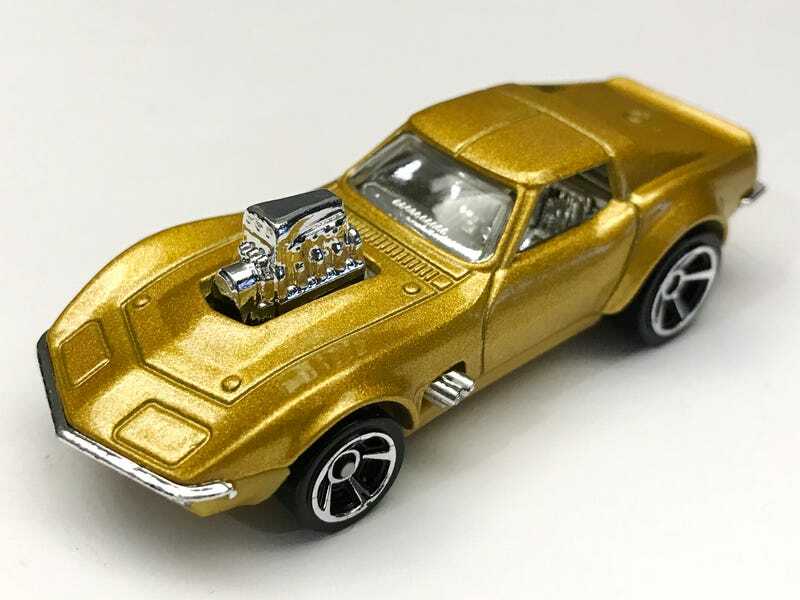 The Midas Monkey* was constructed by Richard Rawlings’ Gas Monkey Garage for the hokey Discovery car show “Fast ‘n Loud.” I don’t usually watch but I tuned in specifically for that episode because I like Corvettes and I like Hot Wheels. Typical car show hi-jinks aside, I enjoyed the episode and I thought they turned out a pretty awesome Vette-rod. In turn it totally translates well to 1/64 scale. It is appropriately Hot Wheelsy. It’s a touch smaller than the ‘69 Corvette cast and about the same size as the COPO Corvette (with some substantial differences). It seems Hot Wheels went with a clean sheet design/cast on this rather than modifying an existing cast. However it’s the paint that steals the show. It’s a slightly lighter version than that which appeared on the tooned ‘63 Corvette from the Mystery Car series. That’s not super obvious in my photo below (they look about the same because the depth of field) but the GMG car is clearly lighter with the direct light in the above photos. And of course it’s light years ahead of the two shades of dull gold Greenlight has used on two similar casts in recent years: the original Gas Monkey Corvette (right) and the Apollo 13 Corvette (left). I’m trying to pare down my desk fleet but I just can’t stuff this one in a carrying case in a drawer back home. It needs to be displayed. It’s too beautiful. I do think it was a missed opportunity to stick a metal base and some redline Real Riders on it and sell it as a premium Entertainment car, but hey, it still turned out great overall.